Wolfskull Cave is a cave west of Solitude filled with necromancers or bandits. The occupants of this cave vary depending upon whether or not the related quest, The Man Who Cried Wolf, is active. The normal cave occupants are bandits, but the bandits are replaced by necromancers and their companions during the quest. The cave's standard boss chest is also unavailable during the quest. The second half of the dungeon, including all of the Wolfskull Ruins zone, is only accessible if the quest has been started. The path leads from the road, behind several bushes, including snowberry bushes to the rock face with the cave entrance that cannot be seen from the road. About 10 yards above and just to the south of the entrance by two trees, there is a dead bandit, a large sack, and two randomized potions. Go to the right of the entrance, go up the slope, and jump up the rocks to access the body or climb down from the nearby Steed Stone. During the related quest there are two skeletons guarding the entrance. The entrance leads into a natural tunnel with an iron battleaxe on the ground a few paces in. The tunnel is lit by lanterns and torches. You come to an area with an empty cart, some bone chimes and a pickaxe on the ground. There is a ledge high up on the right, which will be your short-cut exit after completing the related quest. Further along there is a second pickaxe, a bottle of alto wine and several empty wine bottles next to a patch of blisterwort fungus. Shortly after the path splits with the right-hand side climbing above the left-hand side, which is patrolled by a bandit or draugr during the quest. Taking the right-hand path leads out onto a ledge above a chamber with a campfire off to the left. There is another bandit sat by the campfire that you can snipe or two necromancers during the quest. The chamber has a closed door in front of you. Backtracking and taking the lower path and following it into the chamber seen from above. There are two more blisterwort and four fly amanita fungi along the passage and in the chamber. In front of the door, among both human and animal bones is a woodcutter's axe and pickaxe. While around the campfire are many more empty wine bottles, a rabbit haunch, two raw rabbit legs, a portion of grilled leeks and a medium coin purse. There is also an empty metal pot sat in the fire. Through the door is a flight of stairs leading down into another chamber containing two more bandits, one you can see to the right, the other is further to the right out of sight, one of these is the boss. Off to the left is the boss level chest. Through the door during the quest, the chamber ahead has changed, containing a leveled necromancer around to the right, with a draugr magic-user and either an atronach or skeleton to the left, on the far side of a sinkhole. There is a hanging moss growing from the lip of the hole and the boss level chest has been removed. The only way further is to drop into the hole. If you drop on the northwest side of the hole it is possible to land partway down on a ledge with two burial urns. At the bottom is some rubble from an old fort or similar and a growth of imp stool fungus near the start of a passage heading down to the northwest. This leads to Wolfskull Ruins. Upon entering this area, there is a fort to the north with mystical energy weaving around it. There are many necromancers and draugr patrolling the fort and on the path beneath the ledge you are on. There is a bleeding crown fungus by the end of the passage and a further passage heading down to the west. There are another bleeding crown and a fly amanita fungi along the passage. At the end the passage opens into a chamber with two oil slicks on the ground with several oil lanterns hanging above. There is a necromancer patrolling from the next passage into the chamber which contains two pickaxes, two blisterwort fungi, an iron ore vein and a moonstone ore vein. At the bottom of the chamber the passage has bone chimes and chains hanging down across the passage, making silent progress difficult. Another hanging moss is growing down the wall to the right. There is a flight of stairs leading down at this point with a leveled draugr and necromancer patrolling the stairs. There are five loose septims and a woodcutters axe on the ground at the bottom of the first flight of stairs. At the bottom of the stairs is a passage to the east entering the base of a tower with a spiraling stone staircase leading up a level where an oil slick covers the floor with an oil lantern hanging from the ceiling above. There is a random battleaxe on the ground by a stand with candles on top. Beside this is some masonry with a random poison on it and a satchel under it. There is a doorway to the east that leads out of the tower onto a walkway, with stairs leading down on your right and a path ahead guarded by a draugr. On the lower area is another blisterwort fungus. There is an unlocked chest, a leveled potion of healing and a random poison on top of the tower you have just exited. It is possible, although difficult to use the rocks on your left to jump from the rocks onto the lip that runs around the battlements and from there onto the tower. Ahead is an arch with a leveled draugr standing on the wall on top. Following the path beneath the large arch, there are stairs on the far side and a necromancer standing guard. There are several more hanging moss in this area hanging from the walls and the path turns left and climbs more stairs. At the top is another leveled necromancer and draugr. There are some patches of Namira's rot growing on the ground. The path turns to the south and there is another woodcutters axe on the ground among human bones and a gap leading out onto a wall level with the original ledge you first saw the fort from. There are two leveled necromancers and a draugr patrolling this area. This leads to another doorway at the bottom of another tower. There is a necromancer standing partway up the next flight of spiral stone stairs and four more at the top including one named Ritual Master. Once they are all dealt with, there is a copy of the Light Armor skill book The Refugees on the ritual pentagram at the top of this tower. Also to the southeast a raised wooden bridge with a lever to the left that lowers it. Across the bridge is an unlocked boss-level chest at the top of yet another tower, with stairs leading down to a passage and a wooden door that takes you back to Wolfskull Cave and the short-cut previously mentioned above the empty cart near the entrance. Shooting arrows over the summoning circle and over the large arch to the right of the highest tower can cause several of the necromancers and draugr to attack each other (but see Bugs below), sometimes one or more of them will also converge on you, normally led by a highly leveled draugr who is initially standing on the wall over the large arch. About 10 yards above and just to the south of the entrance by two trees, there is a dead bandit, a large sack, and two leveled potions. Go to the right of the entrance, go up the slope, and jump up the rocks to access the body. One quicksilver ore vein is located outside, 200 feet west-northwest of the cave. 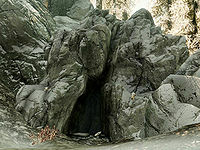 It is only possible to mark this place as cleared if you enter and kill the bandits prior visiting the Blue Palace accepting The Man Who Cried Wolf quest from Falk Firebeard to clear this cave of necromancers, as killing the bandit leader is what marks the place as cleared. If you are sent to Wolfskull Cave as part of a radiant quest (such as Shalidor's Insights), you will not be able to complete the radiant quest while The Man Who Cried Wolf is active. You will need to first finish The Man Who Cried Wolf and wait for the dungeon to reset. Because the necromancers in the ritual area start as neutral, when you get to the final area and can just see the ruins and the swirling blue mists, you can make the draugr kill all the necromancers for you. One or two arrows arced high over the heads of the necromancers to set them looking for enemies, then another arced high over the head of the draugr on the right of the tower to set him to hunting for enemies. They all call their friends, and shortly, the deed is done. In order to clear this cave, you must enter it before The Man Who Cried Wolf quest is active and kill the bandit boss, who is located in the ice cave section of the first zone. The cave can be reverted to its clearable form after The Man Who Cried Wolf quest has been completed by opening the console and entering the code "000ABAB7".disable. An interior map of Wolfskull Cave.